I asked Indy several weeks ago if he could put together a dinner jacket and trousers based off Daniel Craig's formal ware in Casino Royale. About a month later I received a beautifully tailored garment. The dinner jacket itself is nothing short of astonishing. Everything from the subtlely shaded peaked lapel to the functioning sleeve buttons and the rolled to one button lapel is top notch. I opted to have this dinner jacket and trousers made with some distinguishing features, one of which is dual vents. Granted that is typically not the norm, however the beauty with bespoke and made to measure tailoring are the specialty options available. I had the trousers made with a traditional button fly and internal bracer buttons. This dinner jacket and trousers are not your run of the mill "rent-a-tux" for your cousins nupitals variety. This is a piece that you will stand out in the crowd with. While it may not have the sheen or glossiness of a Savvis or Gingis formal ware tuxedo, it has an understated sophistication and elegance to it. 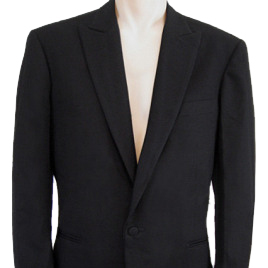 I bought this dinner jacket with the following intentions, for my work, and for my wedding. To have a formal garment that can fill all the necessary demands while remaining timeless in style is no easy feat, but that is why I made the investment. A true gentlemen has a well equipped wardrobe, is chivalerous with the ladies, and always has formal evening ware on hand for those occassions where class and elegance are required. 007 himself would approve.